Fresh groundbeef or defrosted from freezer. Wash, dry and chop assorted veggies. Gather herbs/spices to be used - add to mixture. 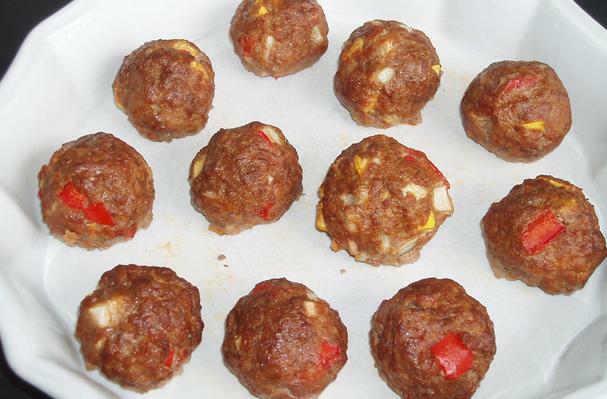 Form groundbeef into balls - size of choice - put on lined baking sheet. Oven mitts or potholders ready to use. Tongs/spatula to transfer cooked meatballs to serving platter/bowl. Yum, just made my Meatballs yesterday once again. Using the veggies I had in the refrigerator for the day, I included my favorite spices and the aroma of homecooking filled my home. Note: use only the veggies and spices you enjoy in this recipe. Be creative :) A few of my favorite things to always include are: paprika,cumin and turmeric. Oh the hearty, earthy flavor!!! Mmmmm. Meatballs - The Healthy Way is a baked version of frying groundbeef. With added chopped veggies and spices, this recipe is not only tasty but healthy, too.